How to get oec. What is the requirements.. It depends on what job you are applying for. A licensed agency can provide you the list of complete requirements needed for that job. Hi sir ely,Ask qlng if i’ll be needing to undergo another medical for poea oec..despite done nq ng medical sa iom clinic before my visa release.. I have read kc blogs telling me that medical is needed as poea requirement..so I ask the clinic and they told me that they cant issue any med cert bec. The medical itself is a private property of the canada immigration..
Ang alam ko lang po na medical ay yung medical na requirement sa pagkuha ng visa. Medyo matagal nga kung nung November pa nag-start. Sa case po ng brother ko, 2weeks lng ung oec. Pero ready na din kasi lahat ng documents nya kaya naging mas mabilis. At least nasa POEA na docs mo. Konting tiis na lang yan. Good luck! pdos or dole clearance po ang ang mauuna iaccomplish lc 1week na since sinbi nlang nsa poea na..wla pa advise skn ng pdos or owwa seminar mn lng..
I’m sorry to hear that. Follow up mo na lang siguro sila ulet kung may schedule ka na for PDOS, pwede naman magseminar while waiting for the OEC. I just called them..my new requirement po daw as of april 10 narelease..police clearance ng employer n red ribbon sa polo..another waitibg game for me..
just wanna share esp. Dun sa mga ngproprocess ng papera on their own..
How to get OEC for direct hire if I proccess it my own without any agency, I have a skilled visa already going to Australia. And have a contract also. You may contact the POEA hotlines at 722-11-44, 722-11-55 for inquiries about your OEC processing. Clarification on my visa, its a temporary work short stay specialist ( subclass 400) that only for 3 months. I tried to email to polo Australia and they are telling me that the ban for direct hires was still going on and need an agency to process my documents. I read in this site that if direct hire the only requirements needed is a contract with authencation from polo or embassy from job site and also you can ask for clearance directly from the director, can you give me some idea about this..
We’ve been to both agencies last year, and there are no fees for consultation. 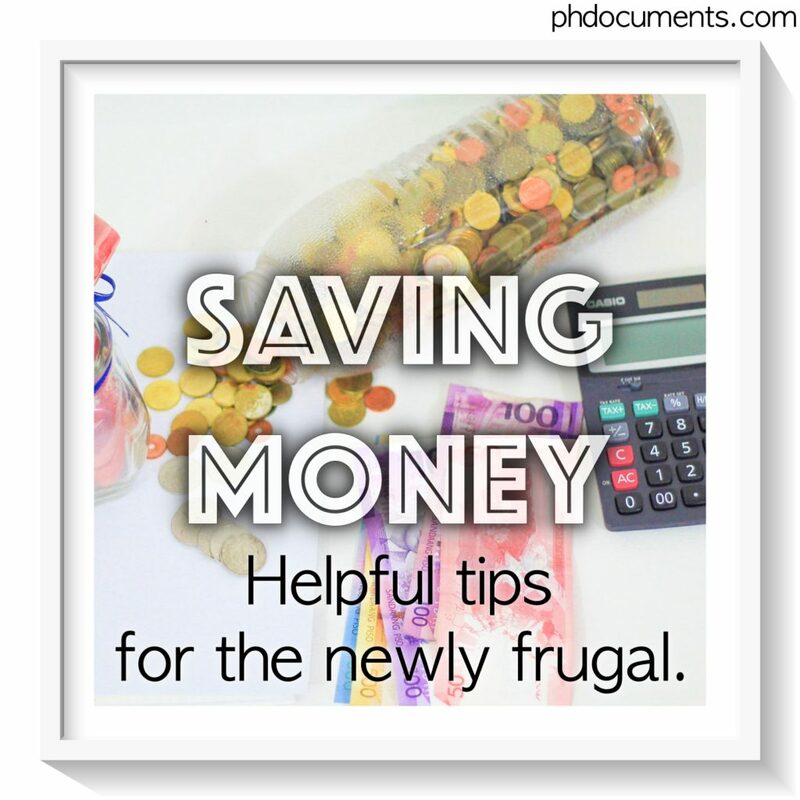 They will give you advise regarding the process, processing time, fees, and requirements. Note however that these are just my personal suggestions, you can try making inquiries or transact with any POEA licensed agency of your choice. HI Mr. Ely how about my husband who is under skilled worker as a machinist he is direct hired from dubai to nz how can we get an oec? He can also go to POEA directly and ask about the exemption for skilled-workers. I went outside country last october 2017 as a tourist,then got hired and now have working visa. I plan to go home but I worry about the process of OEC. how could i get one. It looks like your case still falls under direct-hiring. You will need to seek help from a licensed agency if you want to get an OEC. Sir good afternoon,i have the same case with mr.Jerome do you have any list of license agency giving an OEC? How long do you have to wait for your name to show up in main directory of Notices. Does it take a month to process the clearance? Normally, it only takes 1-2 weeks after submission. But yes, it could take up to a month or even longer. I have an employer in Singapore who is willing to hire me again. I was in fact approved for an S-Pass in Singapore last November 2017 but since it was already strict since that time, they end up cancelling my work visa. I’m having a hard time finding a local accredited agency here in Cebu City. Do you happen to know a list or any recommendation you know that can help me process OEC here in Cebu? Is it also possible for the placement fee to be waived? I would like to ask for your help regarding my case….I worked as a SEA BASED and just now I will be assigned in SHORE BASED…same company online the jobsite was changed. I am qualified for “SECTION 124.Exemption from the Ban on Direct Hiring” of this document (see page 31): since now I am classified asDIRECT HIRE…. I recommend that you visit the POEA office and present your papers, or discuss you case with them for assessment. My guess is, you may only need an OEC as a returning OFW (and to the same employer), and not the OEC for new and direct-hired workers. But it would be best if you consult the POEA regarding this. I have a problem regarding my OEC. I need an exemption from Dole because I’m direct hired. I came back to the Philippines last month and my new employer wants me to fly back to Japan soon . Please guide me on what to do because I cannot get OEC because of the POLO requirements. Please help me! Thank you! Sir good afternoon im paulo,I have the same case with mr.Jerome do you have any list of license agency giving an OEC? Kasama po sa listahan kahit ung mga banned at cancelled na ang license, so make sure to look for an agency with a “Valid License” status. I think they don’t have a consistent turnaround time, it could be between 1-4 weeks. As of today, the latest list of names that they published is dated March 9, 2018. I have a work permit in Thailand and I am currently working here. But I haven’t processed my OEC yet. Do i still need to go through agency or I can directly do it at POEA in the Philippines? what do they mean by “Professionals”? If you are already in Thailand, I think you can process your papers to an OWWA branch in Thailand. By “professionals”, they mean professionals and skilled workers which are qualified under the exemptions – and it’s up to the POEA to determine that. But if you check the comments here, it looks like this exemption is no longer applicable either. Thank you so much Ely!! Appreciate it! I appreciate you answering questions here. You’ve been most helpful! Pwede nyo po kontakin mismo ang POEA kung may exemption pa sa ban, kasi based sa mga comments po dito ay wala na po. Can i still get oec even though my contract is not yet authenticated? My name is already in dole clearance website but my problem is my employer told me that they cannot process my authenticated contract because according to them i need to there in thailand to have it authenticated? What are other options that you may recommend for me to have oec? 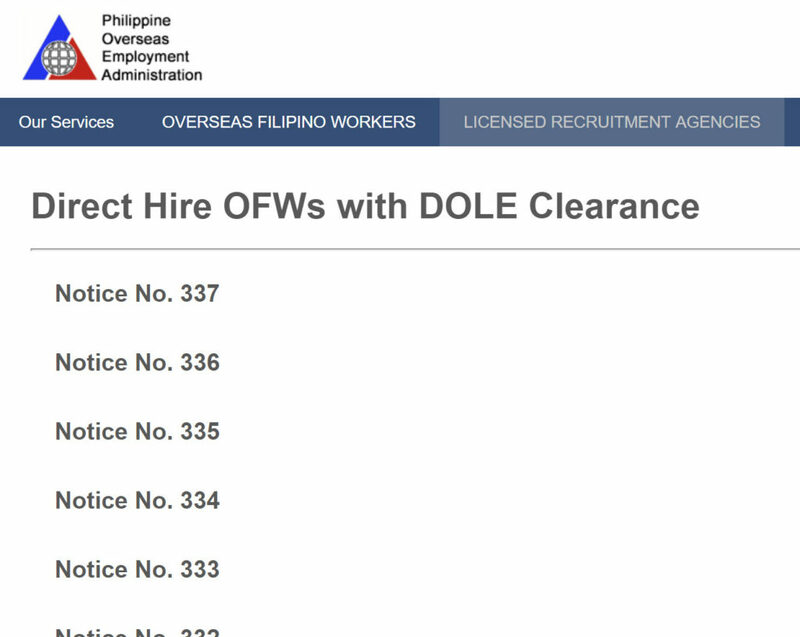 If your name is already on the list of applicants with DOLE clearances, simply the follow the instructions on how to get your OEC. May instruction po dun sa baba ng listahan. hindi po kami kasama sa list since nag start sya 2017 kasi ofw ako way back 2011 my oec ako then matagal ako sa uae with different employers since 6 yrs din akong walang uwi uwi so ngaun naka hanap ako nang employer direct from dubai to nz what will i do to get an oec pag uwi ko dyan this year. I asked my friend to call POEA and check if I can process my POEA without going through an agency since I am a direct hire currently working in Thailand. Sabi ng POEA mag book lang daw ako ng appointment sa balik manggagawa then dalhin mga important documents. so baka implemented pa rin yung exemption. You can ask a friend also to confirm with POEA by calling their hotline. Not sure kung ito talaga yung process but we’ll see pag uwi ko ng Pinas. Thanks for sharing! 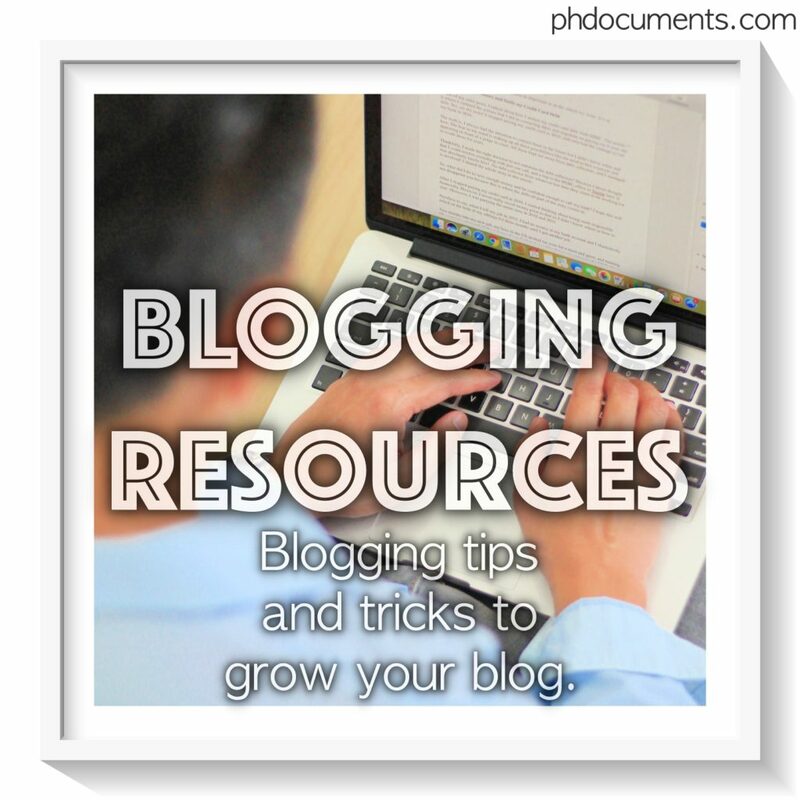 I think that is indeed the process pag galing na abroad, mag-book lng ng appointment sa BM online. The need for an agency is only for first-time workers na direct-hire. 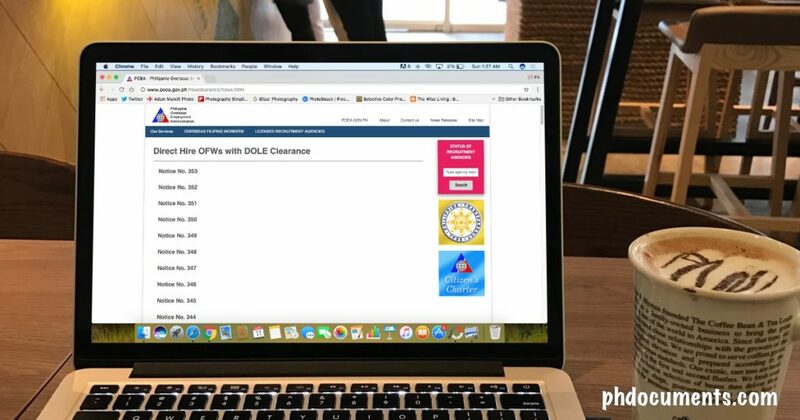 How do I get DOLE Clearance? I think this is my only option as the ban for direct hiring is still not lifted 🙁 . I am currently working here in the Philippines at a subsidiary office of a multi-national company and our mother-company in Canada, offers me a job and i accepted it. Only to find out that there was a ban. Please help. Thank you in advance. can I just ask if its really possible for me to process my papers with poea and dole without going thru an agency? I am an ofw from Singapore but bec my contract ended I have to go back to PH. and now I got hired to teach in Japan and have all the necessary documents to process my visa however I don’t know what to write in a letter to be exempted by the DIRECT HIRE BAN. would you be kind enough to let me know what to say and how to contact DOLE? Good afternoon, mag ask lang ako kasi po nagpass ako ng letter of appeal for direct hired worker. Sabi saken after 2-3 days nasa poea na ang documents ko. Kaso finollow up ko through phone call, walang sumasagot. Pano po kaya yun? Baka masayang lang kasi ang pera at time kung pupuntahan ko sa poea kasi Pampanga pa ako. Thanks po sa sagot. Girlie san kaba nag pasa nang apeal sa direct hired? Magkano binayaran mo? Para din makapag pasa din ako nang appeal sakin..
Sa DOLE po mismo, Intramuros they forwarder my documents in POEA. Ngayon waiting nalang po ako ng updates about direct hired workers with DOLE clearance. Thank you Gerlie, for sharing. Hi po sir ely uuwi po ako ng pinas para magrenew ng passport as required by my new employer. i have been working abroad for 3 years and now I will change my employer. first time ko din pong kukuha ng OEC dahil tourist po ako nung lumabas ng bansa and then i got hired. Government po sa ibang bansa ang new employer ko. can i process my POEA without the help of the agency? or pwede din po ba balik mangagawa but change employer kahit first time ko po kukuha ng OEC. thanks po. Yes sir ely member na po ako ng OWWA. So paguwi ko po pwede ako sa BM pero change employer lang?at hindi ko na din po kelangan dumaan ng agency para kumuha ng OEC? Ung direct hire ban po ba para lang sa mga first time OFW? Medyo confuse lang po kasi ako sir kasi direct hire din po ung new employer ko. Thanks po ulit sir ely. Sa pagkakaalam ko po. Yes, mga first time lang at direct hire ang OEC. Mas mabuti po siguro na mag-inquire kayo sa OWWA dyan para sure. Bali po madali na lang ako makakakuha ng OEC kahit po direct hired din ako nung new employer ko sir ely? Maraming salamat po sa inyo! Ang alam ko po ay hindi na kailangan ng OEC kung BM po kayo. Try nyo po magregister dito: https://www.bmonline.ph/ or mas ok po siguro na kontakin nyo OWWA dyan to confirm/verify. Basta po BM kahit po direct hired ako ng new employer ko hindi ko na po kelangan ng OEC? Thanks po ulit sir Ely. Hello Ely, please refer to the Labor Code of the Philippines. Yes, there is a ban for direct-hire, pero may exemptions po na dapat i-approve ni Labor Secretary. There is no need to contact an agency kung may contract ka na at wala pang affiliated agency ang employer mo. All we need to do is set an appointment and letter with the POEA Administrator/Secretary for us to get a DIrect-Hire approval. Thanks for sharing! I hope this will help others who are confused with the process. Care to share more details on how to set an appointment? Should applicants direct their letters to the POEA office in Ortigas? May I know what documents did you present to the poea administrator to request for exemption? And how long did it take to get their approval? Hi, yung husband ko umuwi siya dahil end contract na sya. Yung shop nila has a new owner,it means only that they have a new employer. The new employer gave him a new contract, re entry and ticket to return in Saudi. Ok naman po sila. My question lang po ako, ano sya direct hire ba case nya? I think so, since walang middle man or agency this time. Tama si Rosiel! ung sa husband ko 4 days lang na complete ung 4 sigatures sa poea and nasa DOLE na din ung papel nya for clearance, meron po ba dito my idea kung ilang days inaaabot un sa DOLE. Hi Ely! I hope you can answer my question. I am hired as a Researcher (E-3) VISA by Ghent University Global Campus in South Korea. Ang question ko lang kailangan ko pa ba dumaan sa Agency para makakuha ng OEC? Wala bang ibang way para makakuha ako ng OEC ? Pano ako makakakuha ng clearance from DOLE? Sorry, I couldn’t answer you question. It would be best if you inquire from the POEA directly. Good evening, ask ko lang po if pwede na magpamedical kahit waiting palang ako sa list ng direct hired workers with DOLE clearance? Thank you so much sa reply. Hi Gie, para saan po yung medical? Kasi yung medical na requirement sa pagkuha ng Visa lang po alam ko. Requirement po ng POEA for OEC. Nasa Step 2 po. PDOS at medical po ang sinabi saken sa POEA. At yung clinic accredited ng DOH po. Thanks po sa reply. Hi Gie, Sorry hindi po ako familiar sa medical ng POEA. I think pwede naman siguro mag-medical na while waiting for the OEC, kasi ang alam ko pwede din mag-PDOS kahit napprocess pa lang ng OEC. It would be best to inquire from them directly, you can call their hotlines at 722-11-44, 722-11-55. Thank you so much Sir Ely, very helpful itong page mo. Sir yun po kayang intermediate skilled worker to canada under AIPP Program ay ksama s direct hire ban?or exempted po s ban?we are thinking po kc if we have to undergo agency or direct n kmi s poea to secure the oec. Sorry, I couldn’t answer this either. It would be best to ask the POEA directly, you can call them at 722-11-44, 722-11-55. Hi Recilyn, I would just like to ask if naka secure ka na OEC? same din kasi ako under AIPP, not sure how to go about this. You are right about the ban on direct hires. Yung mga ibang comments lang po ay yung mga nag-sssubmit ng letter of appeal, at mga OFW’s na qualified under the Balik Manggagawa program. I will be working in TH as a teacher and dto po ako nag paprocess ng Non B Visa ko sa PH. For OEC ng direct hire po kelangan talaga humanap ng agency po ? and ano po ung mga requirements ? thank you po . I am Camille Meyrina I just have some questions to ask . I’m in currently in japan now . I studied in japan for 1 year and 6 months. I graduated last March 16 2018, and now my visa in on process for changing in working visa , my part time job adopted me as direct hired employee. All my papers here in japan is ok I can take a working visa. I’m here in japan do I need POEA? I’m came here in japan as student visa , After I graduated my part time job , direct hired me . My visa is on process now in japan all my documents is ok but my lawyer saying something about POEA and polo ,so I go to polo japan and they said direct hired is band , can I process my documents without going home? Kung may communication ka with an agency, pwede naman ciguro i-process sa Japan ang OEC mo. Pero I think, baka mas convenient kung nasa Pinas ka, especially when your personal appearance is already required sa POEA. Pwede po bang family ang mag asikaso ng papers sa pinas? Mukhang hassle, but you could probably find ways to do it while on the process. Pero pag time na for seminars like PDOS, kailangan po kayo na mismo umattend. Pwede po ba akong mag pa disband ng name sa dole? direct hire po ako papunta ng finland as a personal assistant. tas di ako mkakuha ng oec kasi dw direct hire at nka ban,ngayon hirap po mka hanap ng agency na pwd mag process ng papers ko. bka po may ma recommend kau na agency na pwd mag process. at allowed po ba ako makakuha ng DOLE Clearance sir kahit hndi ako pasok sa skilled worker? maraming slmat po sa pag bigay ng attention at sagot sa tanong ko.more power po! Try nyo po mag-inquire sa Golden Horizon sa Novaliches, or Mercan sa Ortigas. Sila po mismo magddiscuss sa inyo kung ano mga requirements, at kung gaano katagal ang process. maraming salamat po sir. Golden Horizon po ba ang buong.name.ng agency at Mercan lang po? maraming salamat po. pag gagawa po ba ng letter of appeal or request letter pra makkuha ng oec or dole clearance kanino po ba pwd ma address? may ideapo ba kau kung saan pwd ma address sir? Pa-backread na lang po siguro sa mga comments dito: http://phdocuments.com/how-to-get-an-oec-for-direct-hires/ , wala po kasi ako first-hand experience regarding sa letter of appeal. ok sir,maraming slmat po sa mga reply nkaka dag2 po ng idea sa mga kgya ko. more power po! May link po ba kayo ng ready for pick up OFW ID? at saka may nagsabi sa akin na isang fren na wala daw name ko doon kaya nagtataka ako kasi nag file at may OFW ID number na ako noong nagfile ako online para sa OFW ID. pero yon nga wala daw sa list ang name ko. Pwede nyo po i-follow up sa POEA mismo, hotline 722-11-44, 722-11-55. Or check nyo dun sa Philpost branch na pinili nyo kung san idedeliver ung ID. Babakasakali lang kung marereply-an pa ‘ko sa inquiry ko. Dati na kong OFW, meron na kong OEC record pero dahil sa important family matters napunta sa family visa ako mula sa work visa. This year, nadecide na ko magwork ulit at need ko umuwi ng Pnas para dun magprocess ng work visa sa Embassy ng bansa kung nasaan ako. Ang di ko lang alam kung paano ang gagawin ko sa OEC ko, magreregister ba ko sa bmonline (never pa ko nakapagregister) or dadaan ako sa masalimuot na proseso na kekelanganin ko magpatulong sa agencies na nakalist sa POEA? Walang makasiguro kung ilang araw o linggo ang kakain ng pagiintay bago matapos mabigyan ng OEC. Sa totoo lang, nauubos ang araw ng walang sinasahod, magbabayad pa ng madami bago maka-alis. Ansakit isipin! ask ko din po sana kung may advise na po ba na malift ung BAN sa direct hire. Unfortunately, mukhang wala po chance na ma-lift ang ban anytime soon. From our experience, there seem to be a huge disconnect. The people in the PH Consulate Office in Vancouver were surprised about how complicated it is for applicants to get a clearance. Ibig sabihin, hindi sila updated about DOLE or POEA requirements. Sa POEA office na lang po siguro i-diretso ung question mo, mukhang sila lang makakasagot. Hi po, if bagong ofw po and may working visa na gaano katagal ang oec, under agency po ako, may 2018 papo naprocess oec ko till now wala pa..
Hello po sir, I am here in Australi but got a job offer and work visa for NZ how can I get the OEC po? Plan ko po p po kc sna umwi ng pinas pero nagdalawang isip p po ako bka kc mhirapan ako kmuha ng OEC. I am based now in Guatemala, I got hired directly here while I was traveling in the country last July 2017. I am working as a teacher here. How do I apply for a direct hire OFW? I am returning in PH this July as well and will be back in Guatemala in August. Medyo kelang cguro ako sa time to process things? Please advice. Thanks! hi po sir ely ask ko lnag po gaano katagalbago makuha ang oec?? how many weeks po talaga? Depende po sa agency (kung nag-agency kayo), at sa availabiliy ng mga pipirma ng mga docs nyo pag nasa DOLE na. Pwedeng 2 weeks lng or up to 3 months or more. Sir ely.good day..on my case..meron n po ako 6 monhts 6 months work visa sa oman..sinend lng ng employer ko un visa copy..sa oman immigration n raw stamp ang visa..kelangan po ba contrat of employment galing sa visa name sponsor..welder po ako..anu pa kelangan reqyirements..thank you..
working po ako sa singapore. last week kinailangan ko umuwi ng pinas kc ngmisscarriage ako. then saka ko naalala na expired n ung owwa membership ko at kailangan sya iupdate ng employer kc kakalipat ko lng ng employer 1 month ago. what do i need to do pra makarenew ako ng owwa membership and at the same time maupdate ko ung employer ko? I am working in Shenzhen China for more than 5 years and I am a registered OFW. I changed to a new company and already started working now for a few months Currently, we are more than 10 filipinos working here. Now I plan to go back to Philippines for vacation. Do I still fall under returning OFW or Balik-Manggagawa? Thanks. Yes po. Inquire lang po kayo sa POEA para sa tamang proseso. I’m working as seafarer, may agency ako ditto sa Pilipinas. Kinukuha ako as direct ng employer ko, pwede po ba yun? Offshore po ang nature of business ng principal. Offshore Seafarer po ako and may agency sa Pilipinas. Kinukuha po ako ng principal ko as direct sa company nila. Pwede po ba yun ma direct hire? If based from the 2017-2018 process, mukhang hindi covered ng mga exemptions nila dati. Pero baka bago na po ulet mga rules ni POEA at DOLE. Mas ok po kung sa POEA kayo mismo mag-inquire. one more thing sir, if i’m working seafarer offshore as Senior warehouseman, semi skilled po ba un? we have 1 crew and hired directly by the principal last 2006, exempted po ba sya? kasi until now hired pa rin sya, means wala syang problema sa POEA?